It seems like these days comic books are all the rage, but it wasn’t very long ago that this medium was frowned upon by the general population and was relegated to nerds and geeks. But the thing about nerds and geeks is that they’re very in tune with their creative side, and it is not uncommon to find that many of our favorite creators are lifelong fans of comic books and graphic novels. 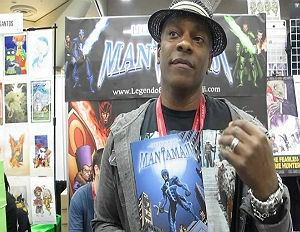 The first issue of the “Legend of the Mantamaji” series was released in October and features lettering from Eisner Award nominee Deron Bennett (Jim Henson’s Dark Crystal and Helldorado). The graphic novel series tells the harrowing story of New York Assistant District Attorney Elijah Alexander, who learns that he is the last of an ancient order of mystical knights called the Mantamaji.